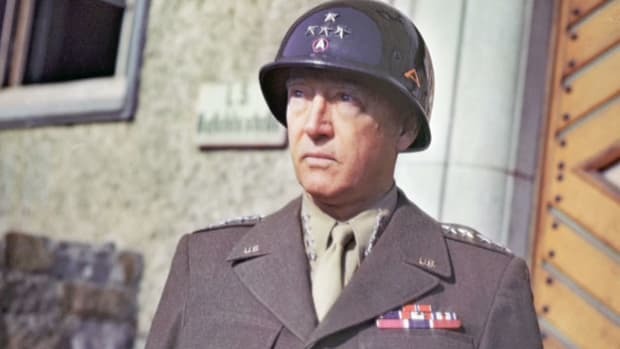 Educated at West Point, George S. Patton (1885-1945) began his military career leading cavalry troops against Mexican forces and became the first officer assigned to the new U.S. Army Tank Corps during World War I. Promoted through the ranks over the next several decades, he reached the high point of his career during World War II, when he led the U.S. 7th Army in its invasion of Sicily and swept across northern France at the head of the 3rd Army in the summer of 1944. 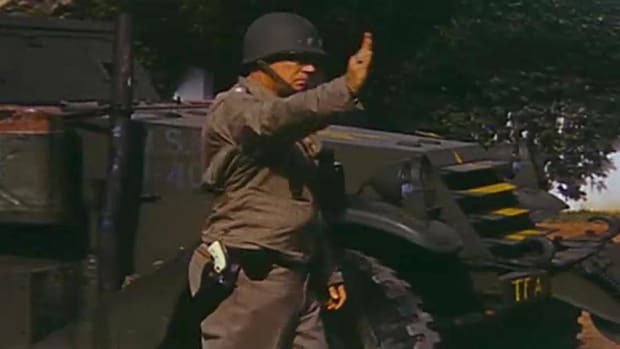 Late that same year, Patton’s forces played a key role in defeating the German counterattack in the Battle of the Bulge, after which he led them across the Rhine River and into Germany, capturing 10,000 miles of territory and liberating the country from the Nazi regime. Patton died in Germany in December 1945 of injuries sustained in an automobile accident. 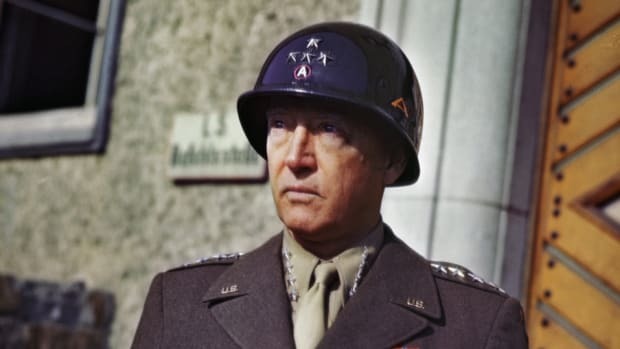 George Smith Patton was born in 1885 in San Gabriel, California. 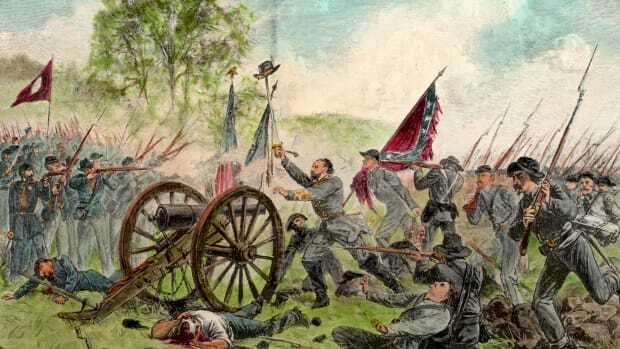 His family, originally from Virginia, had a long military heritage, including service in the Civil War. Patton decided early on that he wanted to carry on the tradition, and graduated from the U.S. Military Academy at West Point in 1909. Patton gained his first real battle experience in 1915, when he was assigned to lead cavalry troops against Mexican forces led by Pancho Villa along the U.S.-Mexico border. He served as aide-de-camp to General John J. Pershing, commander of American forces in Mexico, and accompanied the general on his unsuccessful 1916 expedition against Villa. Did you know? In 1912, George Patton represented the United States in the Stockholm Olympics, competing in the modern pentathlon. Of the five events--running, swimming, fencing, riding and shooting--he fared poorest in shooting, but still managed to finish fifth overall in the event. When the United States entered World War I in 1917, Patton went along with Pershing to Europe, where he became the first officer assigned to the newly established U.S. Tank Corps. 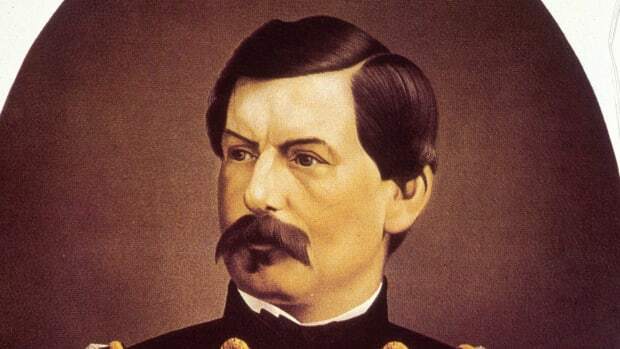 He soon earned a reputation for his leadership skill and knowledge of tank warfare, particularly after U.S. and British troops emerged victorious from the first major tank battle at Cambrai in France. After the war, Patton served positions in tank and cavalry units at various posts in the United States. By the time the country began to rearm itself in 1940, he had risen through the ranks to colonel. Soon after the Japanese attack on Pearl Harbor in December 1941, Patton was given command of the 1st and 2nd Armored Divisions and organized a training center in the California desert. Patton headed to North Africa late in 1942 at the head of an American force; before the initial landings on Morocco’s Atlantic coast, he presented his troops with an expression of his now-legendary philosophy of battle: “We shall attack and attack until we are exhausted, and then we shall attack again.” Patton’s lust for battle would earn him the colorful nickname “Old Blood and Guts” among his troops, whom he ruled with an iron fist. With this formidable aggression and unrelenting discipline, the general managed to put U.S. forces back on the offensive after a series of defeats and win the war’s first major American victory against Nazi-led forces in the Battle of El Guettar in March 1943. 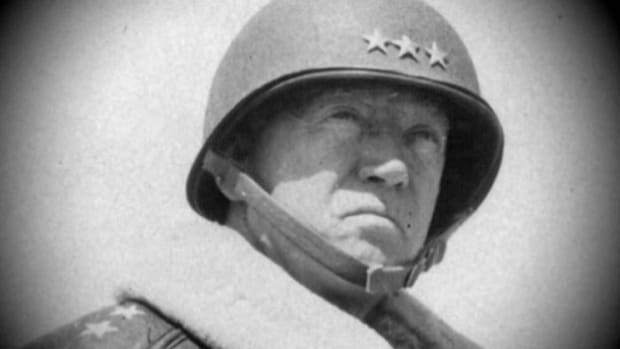 A month later, Patton turned over his command in North Africa to Gen. Omar Bradley in order to prepare the U.S. 7th Army for its planned invasion of Sicily. The operation was a smashing success, but Patton’s reputation suffered greatly after an incident in an Italian field hospital in which he slapped a soldier suffering from shell shock and accused him of cowardice. He was forced to issue a public apology and earned a sharp reprimand from General Dwight D. Eisenhower. 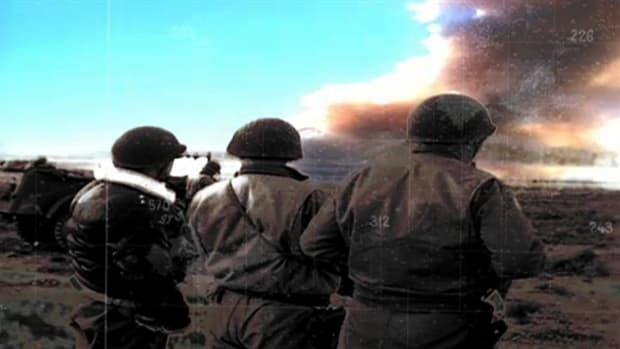 Though he had greatly hoped to lead the Allied invasion of Normandy, Patton was instead publicly assigned command of a fictitious force that was supposedly preparing for an invasion in southeastern England. With the German command distracted by a phantom invasion of Pas de Calais, France, the Allies were able to make their actual landings on the beaches of Normandy on D-Day (June 6, 1944). After the 1st Army broke the German line, Patton’s 3rd Army swept through the breach into northern France in pursuit of Nazi forces. Late that year, it played a key role in frustrating the German counterattack in the Ardennes during the massive Battle of the Bulge. In early 1945, Patton led his army across the Rhine River and into Germany, capturing 10,000 miles of territory and helping to liberate the country from Nazi rule. 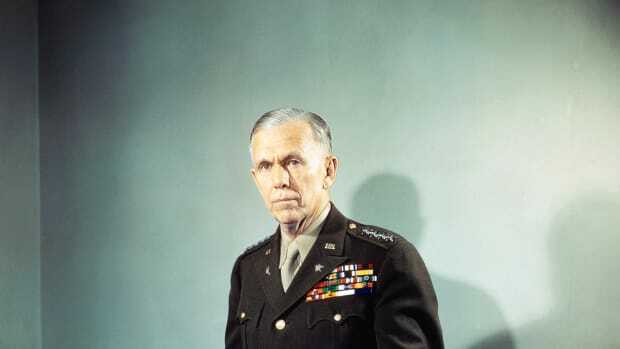 In the months following Germany’s surrender, the outspoken general caused another firestorm of controversy when he gave an interview criticizing the Allies’ rigid de-Nazification policies in the defeated country; Eisenhower removed him from command of the 3rd Army in October 1945. That December, Patton broke his neck in an automobile accident near Mannheim, Germany; he died in a Heidelberg hospital 12 days later. Patton’s memoir, titled “War As I Knew It,” was published posthumously in 1947; his larger-than-life persona later made its way to the silver screen in an Academy Award-winning 1970 biopic starring George C. Scott.